After combing all top-rated longboards on the market, we draw to a conclusion that the Santa Cruz Lion God Rasta Freeride Longboard is the best longboard of all. While it may be true that each longboard is specifically designed for speed, balance, and precision, this best longboard is the perfect combination of all 3 at a reasonable price. It features a low deck frame that grants stability, soft wheels for ultimate grip, and lastly, ABEC 9 rated bearings with high-speed lubricant for speedy performance. It’s well-equipped to function as both an entry-level and professional longboard, bordering on a flexible and high-class longboard that’s a cut above the rest. This product is a privilege to use, thanks to its unique capabilities and valuable price range. What’s significant about the Santa Cruz Lion God Rasta Freeride Longboard is that is features 75mm Road Rider wheels, Road Rider 180mm Trucks that have a 45 degree baseplate angle and an impressive 60mm axle height. Given its sturdy construction, this best longboard is suitable for many longboard activities such as cruising. This board is practicable to take you where you need to go. It is speedy, rider-friendly, and an incredible deal for the price. 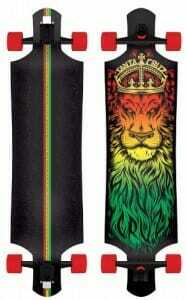 You can’t get a well-suited longboard such as the Santa Cruz Lion God Rasta Freeride Longboard at such an easy valuation. As riders, you not only place significance on how well the longboard functions in action, but you also consider its overall graphic design appeal. This best longboard has a unique graphic design with bright colors that stands out. On top of all this, we’re certain that you’d love to know that this best longboard is well-received online with majority of premium quality components that will help improve your longboarding experience. In addition to the best longboard on the market, we have our upgraded pick with references to price and also performance. The Loaded Dervish Sama Longboard Skateboard is an upgraded model from its original release of concave profile and tail kicks for stability. This one is build for extra durability, better dancing, and excellent footwork. This is one of those longboards that is designed to adapt for versatile riding styles, making it shreddable in terms of performance discipline and overall durable construction. This best longboard features a longer deck to accommodate extra nose and tail kick. We also found that the deck is considerably wider than what it used to be through the standing platform. This results in added stability and balance for riders. The overall construction of the Loaded Dervish Sama Longboard Skateboard is a laminated bamboo core sandwiched between epoxy and tri-axal fiberglass and CNC precision cut drop-throughs. 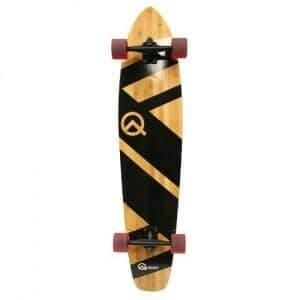 The Quest Skateboards Super Cruiser Longboard is our best longboard pick on the market, and now that it’s so inexpensive in price, we feel you can’t get such a good enough deal for the money. You get highest quality materials, sharpened structure, and improved performance for what you’re paying. It is a 44 Inch bamboo longboard with a multi-ply hardwood maple and bamboo deck and durable 70mm PU wheels. It also comes with a 7 inch aluminum inverted kingpin and 7 inches of lightweight and sturdy aluminum trucks. This best longboard is such that you won’t find anywhere else, especially at such an affordable price range. If you ask us, we’d recommend this longboard first before any else as it features such a ‘balanced-act’ that even professionals wouldn’t get over it so easily. What to look for in the best longboard? Before we get into the details of the best longboards on the market, let us consider some of the best features that you should look for in the best longboard. * Deck Type: Maple, bamboo, and carbon fiber. * Wheels: Wheel hardness, wheel diameter size, wheel durometer, and resistant to ‘Wheel Bite’. * Bearings: The ABEC rating denotes the quality of the bearing. The higher the rating, the better and more professional the deliverance of the bearings. * Grip Tape: For a longboard, the longer the grip tape size covering the platform, the better. * Riser Pad: This is an optional feature depending upon the rider’s requirements. They are mounted between the truck and the deck for an elevated posture. It is made out of high-quality plastic material, generally used by professionals. Any product that’s trending with powerful features and efficient performance must be carefully understood before purchasing. Longboarding allows for a balanced and smooth ride if taken seriously. It is the kind of skill that youngsters pride over and adults find extremely rewarding and convenient. The first thing you should do before reading further is determine the purpose of your purchase. Each best longboard differentiates based on how you will be using it- for example, are you learning how to ride one? Do you require one for daily commute? Are you buying on for freeriding or for competitive riding? Every board is made for its own specific purpose, while some are made universally; we’ve covered those for you as well. It is imperative to know all your vices before purchasing the best longboard in the industry such as your budget, skill level, and the basic longboard know-how. The best way to maintain a longboard is to not store it outside under any circumstances. Exposure to direct sunlight and water may cause serious damages to your board in the long run, thus deprecate its overall performance. With the different kinds of longboards available on the market, we recommend to steer clear of ones that might seem more professional-grade just because they the most expensive ones because as an entry-level or intermediate rider, you’d want something more satisfying and rider-friendly capabilities. If you’re looking for the best longboard that doesn’t give you a hard time, especially after enduring usage, the Santa Cruz Lion God Rasta Freeride Longboard is the perfect pairing. It is a lightweight, but extremely durable longboard that weighs only 7 pounds. It comes with 75mm diameter wheels with a 78A durometer rating, best for versatile longboarding activities such as carving or freeriding. This best longboard is also build out of the most top-ranking and high-quality trucks, that is Road Rider trucks that features a 180mm hanger with 45 degree baseplate angle. Furthermore, these extremely sturdy Road Rider trucks have a low 60mm axle height for better motility. If you’re riding long-distances and are scared of the post-riding condition of your longboard, it’s time to ditch that fret and purchase something that’s durable and reliable for the challenging longboarding task. It’s about time you invest in an advanced longboard that is the exact match to your needs and not what’s best in terms of price. The Santa Cruz Lion God Rasta Freeride Longboard is one step ahead in terms of overall persistence as its solid frame is nothing short of powerful during high speeds; so you don’t have to worry about speed wobbles while longboarding high speeds. Another key point to remember is this best longboard’s low center of gravity for maximum stability. If you skate as much as you want to, this longboard doesn’t wear down easy and neither does it cause any less riding capability over time. It features the ideal downhill capability and the smooth riding makes it worth the money you invest. The Santa Cruz Lion God Rasta Freeride Longboard is designed in similar fashion to balance perfectly between a good flex and carve ability for riders to glide without worry. We recommend his best longboard to all longboarding enthusiasts only to find its impeccable dynamics a cut above the rest. Before we get in on the Loaded Dervish Sama Longboard Skateboard as being the most expensive one on the list, let’s talk a bit about its impressive design. What we loved most about the Loaded Dervish Sama Longboard Skateboard is that is features a good curve. It has the loaded camber/concave combo which offers an impressive spring under your feet, while still maintain a solid ability to lock your feet in at all times. This best longboard features a regular skate grip through the standing platform and features a coarser grip on the nose and tail. So riders can easily shift their feet around on the main without flinching or toppling over to the side. Moving forward, it’s pretty evident that the Loaded Dervish Sama Longboard Skateboard is designed more for a solid grip stand than for any other purpose. If you really want to catch hold of your longboarding skills in order to be experimental and well-balanced, this is the best longboard to try right away! In retrospection, our team of researchers determined that this best longboard is built detail-by-detail to form a complete dominating package for professional longboard riders in the industry. It features a decent flex, a sturdy wheelbase that provides extra stability at high speeds, and lastly, dual kick tails that offer the rider more balance to try out new styles and tricks. This also makes the longboard more responsive and adaptable to new styles as you go. Another deciding factor of is its multiple flex options that features a third flex pattern for more control and camber for efficient gliding and turning, especially at lower speeds. The most important part about a longboard is the rider’s ability to glide on it smoothly, once a rider achieves that, it marks the good character of the best longboard in the industry. And our researchers believe the Loaded Dervish Sama Longboard Skateboard is well-equipped to be valued highly as the perfect rider’s gear. The Quest Skateboards Super Cruiser Longboard is not a compromising longboard, regardless of skill level. If you don’t have any experience longboarding and require something more rewarding than just professional-grade, then this is the best longboard for you. On the other hand, if you’re an experienced skater of sorts who loves to keep up with the best, then too, this is the best longboard for you. This longboard has advanced features for smooth gliding without the burden of a conventional longboard defects that create a nuance for riders everywhere. With the Quest Skateboards Super Cruiser Longboard’s level high deck frame it is time you start experimenting with turns and cruising just like you wanted to. Apart from that, it also features 70mm polyurethane wheels with 7 inches of rugged aluminum trucks for added comfort. This also helps prevent the common ‘wheel bite’ burse on longboards, plus it keeps the wheels protected from heat and sunshine. You see how forward-thinking and reliable this longboard is that it keeps away even the most overlooked defects away from riders so they get to focus on what’s really important. Moving forward with this best longboard, we also found that it comes with ABEC 5 bearings with hollow 4mm risers, plus the perfect material combination of wood, aluminum, plastic and polyurethane for a rugged and lightweight framework. Other impressive features include 80A of wheel hardness, a wider deck frame for added stability, a durable kick-tail, and lastly, beveled edges on the wheels with a large contact patch for great traction. To conclude, our best affordable pick stands undefeated among its competitors with an incredible customer rating, plus a long-lasting and professional background. This best longboard can be purchased for beginners as well as for professionals as it makes a good cruiser with rider-friendly and adaptable capabilities. Inspired by two very common standpoints for that are necessary for every skater in the industry, the Quest Rorshack Bamboo Longboard is a 34 inch bamboo longboard made with rugged aluminum trucks and durable wheels. It features a unique Splatter graphic that caters to the right kind of attention as beginners glide through on this on their own terms. What’s best about purchasing this longboard is that is in-between the most expensive ones and the most cheap ones; it’s reliable, durable, and has long-lasting effectiveness. Unlike the conventional beginner longboard, the Quest Rorshack Bamboo Longboard is made of high quality material that’s super-flex bamboo and hardwood maple deck with a unique ‘Action Sports Lifestyle’ reputation that best caters novices rather than professionals in the industry. It comes with a riser as well as a 24 inch wheel to wheel measure that makes the best cruiser and craver board with the kind of gliding that’s easy to adapt depending upon the rider’s approach. Other impressive features of this best longboard that we most absolutely loved are 6 inch aluminum trucks, 65mm polyurethane wheels, durable kick tail, and a rugged hybrid deck material to add more flexibility to the board while keeping it lightweight and rider-friendly. If you can’t find what you’re looking for, especially when it’s for a professional longboard that’s specifically designed to cater to experienced masters with professional-grade capabilities, then for that purpose the Yocaher Professional Speed Complete Longboard is the best longboard there is. It comes fully assembled with ABEC 7 chrome bearings and a total weight of around 8.2 pounds. This is ideal for professional riders and as it can withstand weight up to 300 pounds and ride up to speed of 35 miles per hour, it’s every rider’s dream! This best longboard has a wheel dimension of 70mm with a 78A hardness level that ultimately provides excellent stability and balance for the long glide. Furthermore, the centre of the deck is positioned extremely low and long for comfort and the well-defined hardness of the wheels add to the balance ensuring that you don’t accidently topple over while high speed cruising. The wheels are also designed to resist sudden shocks and strains on uneven surfaces, although not so quite effortlessly, but they’re efficient enough to handle by professional riders. The overall construction of the Yocaher Professional Speed Complete Longboard is easy to control with an improved standard ideal for professionals. Other features include a black grip tape of premium grade 80A, heavy-duty HD7 trucks, and 9-ply Canadian maple. There is good news for you buyers who are looking for a longboard that’s closely-competitive to the best affordable pick on the market. The Eightbit 41 Inch Drop Down Complete Longboard is a drool-worthy reflection of your investment, that too at such an affordable price range. Rated as one our best longboard for the money as well as our best longboard for longboarding enthusiasts, the Eightbit 41 Inch Drop Down Complete Longboard is a drop deck longboard. It features a considerably higher ends of the board than the main standing platform, at the middle of the board. This longboard is made out of 8-ply laminated maple that allows more stability and a stiffer deck. The trucks of this best longboard are heavy-duty aluminum alloy and wheels have ABEC 7 bearings. Perfect compact longboard for making quick turns while giving stability to riders, the Eightbit 41 Inch Drop Down Complete Longboard grants more control and motion to entry-level riders and a wider and strong riding approach to professionals. The deck frame is much closer to the ground which makes gliding much simpler and less complicated for riders to get a grip of. And we don’t mind its lack of sliding ability as it features tons of other advantages that make it our best longboard for the money. Want a smooth ride? The Rimable Drop-Through Longboard is our top-rated pick that’s also of the close best-sellers receiving over 200 positive customer reviews online. It has a freerider deck frame made of 9-ply material and a 7 inch aluminum truck. This is the best longboard for riders looking for a standard longboard but with a long-lasting turning radius and long-distance craving. It guarantees a smooth ride with its 70mm polyurethane wheels and ultra low resistance that makes the Rimable Drop-Through Longboard an undefeatable pursuit in the industry. The first thing we noticed is that it has a wider deck frame that is impressively strong enough to absorb common bumps and puddles in the road due to its smooth flex ride. Even the grip tape of this best longboard is made of the toughest quality so you don’t have to worry about slipping off during wet weathers. The reason why this makes our best long-distance longboard is because of its relatively softer wheels that won’t stop in the middle of bumps and strains; all they do is increase stability with the increasing speed. Those who are a constantly taking up new sport activities will find longboarding most fun and energizing with the Rimable Drop-Through Longboard as it’s affordable, lightweight, durable, and an extremely stable product with a graphic design appeal. Depending upon where you live, a downhill longboard can be an excellent addition to your collection while being a versatile choice too! When it comes to other downhill longboards, Sector 9 Natasha Downhill Division Longboard is good enough to handle riding at high speeds. Another key point to remember is that it has an incredible standing platform with just the perfect concave to adapt for slides easily. This best longboard comes with 72mm Race Formula wheels with PDP ABEC 5 chrome bearings and a solid grip tape. It has a solid and soft-landing wheelbase perfect for downhill riding at high and moderate speeds. It even features an 8-layered ply pressed maple in a taco mold with fully dipped color and CNC drop through mounting. What’s significant about the Sector 9 Natasha Downhill Division Longboard is that it’s capable of getting you to places with a challenging terrain at moderate and high speeds. Furthermore, it has a 30.5 inch wheelbase for aggressive turning touchstones. To conclude, this best longboard is designed for superior downhill performance which means more stability and more control over to riders. If you’re as serious a rider as this longboard, then it is safe to say that it’s the best you’ll have so far! Another impressive product out of Sector 9’s pockets is the Sector 9 Fractal Complete which features as the best freeride longboard on the market. Freeriding means more comfort, balance, and stability, and all with all conventional freeride longboards on the market, this best one is stands unmatched through it all. It has the sort of construction that’s perfect for smooth riding, but still adept enough to take on tight turns from time to time. It’s suitable for straight roads as well as rugged ones. What we found most intriguing about this best longboard is its innate capability to be built for speed and agility. This is the type of longboard riders would wish they had grown up with because of how well-balanced and solid its wheelbase and deck is. This results in more control over to riders and less blunders overall. The deck of the Sector 9 Fractal Complete has multiple cut-outs on the front and rear that serve a special function to prevent the common ‘Wheel Bite’. Pushing forward, it also features PDP ABEC 5 bearings and 9 inch Gullwing trucks and 69mm Nineball Slalom Wheels. This best longboard works best for carving practices and grants more control to riders, thanks to its low center of gravity allowing for just enough flexibility during freeriding. Speaking of versatile longboards that are built for a specific purpose, we couldn’t leave out the Atom 40 Inch Drop Through Longboard. It features the sort of weight, capacity, durability, and ever-lastingness for any age or longboarding skill level. This best longboard checks boxes so easily, thanks to the strength material flexibility in its deck, that you’d be amazed at how reasonable priced it actually is. The Atom 40 Inch Drop Through Longboard comes with a maple/bamboo hybrid laminate with photo heat transfer graphic and a coarse 46 grip standard. It’s our best drop through longboard because it features Atom AREA 51 70mm wheels with a 78A hardness level. It also features ABEC 9 chrome bearings with high-speed lubricant. What we loved most about the Atom 40 Inch Drop Through Longboard is its craftsmanship with no unnecessary resistance, unless it is a required phenomenon for smooth riding. The overall board is compact and stiffer to get the 180 degree turn, plus it is incredibly solid with a great wheels and bearing combination. With its comfortable concave and broad deck, it is suitable for all body types to just on riding. The angle of the baseplate of this truck is close to 40 degrees which means increased stability and improved high speed motility. Overall, it makes the best longboard on the market for those looking for something more specific, yet powerful. What’s better than a 40 inch board that’s just suitable for drop-throughs? The answer is a 41 inch longboard that’s more than perfect for low-riding dynamics. The Atom 41 Inch Drop Through Longboard comes with an ultra low-riding framework that maximizes stability to yield easy gliding at high speeds. It comes with a full maple laminated deck with 245mm axles. It has Wide-Lip 70mm super high rebound urethane wheels with ABEC 9 chrome bearings with a high-speed lubricant. This best longboard is perfect for low-riding conditions at it gives the perfect 9.6-inch leverage while making turns, hence resisting the common ‘Wheel Bites’. Its Reverse King Pin trucks have the kind of stability and stamina one would expect from a conventional low-riding longboard on the market. One of the most common complaints with affordable low-riding longboards is that it can get extremely stiff to speed to high speeds, thus disrupting the entire riding experience, but the Atom 41 Inch Drop Through Longboard is quiet the exception in this case. You’ll find that the bearings of this best longboard so perfectly sturdy and durable that you can easily catch your paces and increase high speed stability effortlessly. The Atom 8.5 Inch Pintail Longboard is our classic, but most valuable pick on the market. To be brutally honest, this is the type of entertaining longboard that we just couldn’t resist because of two primary reasons. First, it’s so effectively priced that you had to know about it, and second that is comes with some impeccable features such as 78A urethane wheels, and full coverage 80S grip tape that we couldn’t miss its appeal. You can consider this as a useful entry-level longboard with a pin-tail deck shape that allows maximum comfort for a smooth riding experience. If you recently got into the sport of longboarding, we recommend you to go with this best longboard immediately. It is made of maple laminated deck with 8.5 inch aluminum trucks and ABEC 5 bearings. It even features an attractive graphic design that will definitely turn some heads, on top of its outstanding entry-level performance. For its comfort and cheap price, you won’t find something as lively and useful as the Atom 8.5 Inch Pintail Longboard anywhere on the market. To conclude, this best longboard allows you to appreciates its overall quality, especially because o its PHT graphic material, polycarbonate hubs, and 65mm urethane wheels with 90A-HR suspension system. We sincerely hope that this review was able to help you sort out the best longboard for you and the unique features it has to offer. For us, the best longboard is the Santa Cruz Lion God Rasta Freeride Longboard followed by our most expensive and then budget-friendly pick. It is much better to have a variety of options than just one under magnified inspection because that way we know for a fact that given the high demand for longboards, not everyone wants the same one, all the time. Buyers have an altogether different approach in one of the fastest growing sports in the world, that is longboarding and while not all longboards are made for beginners or professionals, it is imperative that we list the ones that are made for their own special purpose. Here you have the best, second to best, and so on so there’s no window of confusion as our extensive research and recommendations will direct you on the correct path to satisfy your needs.